Here is the place to learn more about how the Young Innovator Awards work. It covers everything from how to register, and submit an innovation, to the judging process and the judges themselves, through to the prizes up for grabs for our winners. The challenge is to come up with an innovative product or service. We are looking for extraordinary ideas that address real-world problems. It can be an original idea, or you can adapt your entry from other school projects/competitions (e.g. technology/science/business, YES, Mashup). You can enter as a team of up to five students from your school or from other schools in the list of Instep schools, or you can enter individually. Our first-place Junior & Senior winners receive valuable internship experiences with the some of the Bay’s top innovative businesses plus prize money of $1000 and $2000 respectively. All second-place winners take home $250, and third place takes home $100. Additional internships may also be awarded at the judges' discretion. There's also the People's Choice Award, which includes a $200 Bayfair Shopping Centre gift card for one winner from each category. Entering YiA is easier than ever with our new online system. Simply follow these four steps, from registration through to submission. Start by registering an account for free on our website. All we need to know is your name, email address, school and school year. This captures the essence of your innovation, who it is for and the problem it solves. ‍‍We want you to communicate the problem you are trying to solve, how big it is, who it affects and why it matters on this worksheet. You should communicate who your innovation is for, what they need, who you spoke to when carrying out your research and what technology or science you might use to make innovation work. 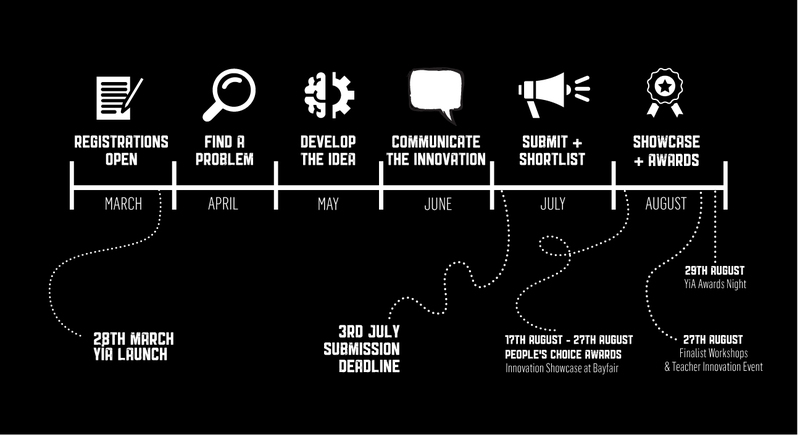 Here we want you to explain your final idea, how it works, and how it solves a problem to make the world a better place to live. This is the fun part! Every innovation entered into YiA needs a 15-30 second video which explains your idea. This is your chance to really sell your innovation to the judges. You'll need to upload your video to YouTube or Vimeo before submitting your innovation, but don't worry, we've made a video showing you how to do this! Your deadline is July 3! If you're entering as a team, make sure all of your team members are registered under your team name before submitting. Learn more about our judges and our judging criteria here. Our judging panel is made up of top local innovators as well as international guest judges from a huge variety of backgrounds. Get to know the team of people who will be judging your entry! Explain how you identified your problem or need, and evidence of research that it is a real issue. Demonstrate an understanding of the needs of your target audience and the changes you've made in response. Explain your process of selecting your idea, how it solves the problem, and why it's better than what's available, and the technology required. Consider environmental factors and factors that would impact people and communities related to your idea. Use a variety of communication styles, including a well planned and executed video, and worksheets to a high standard.